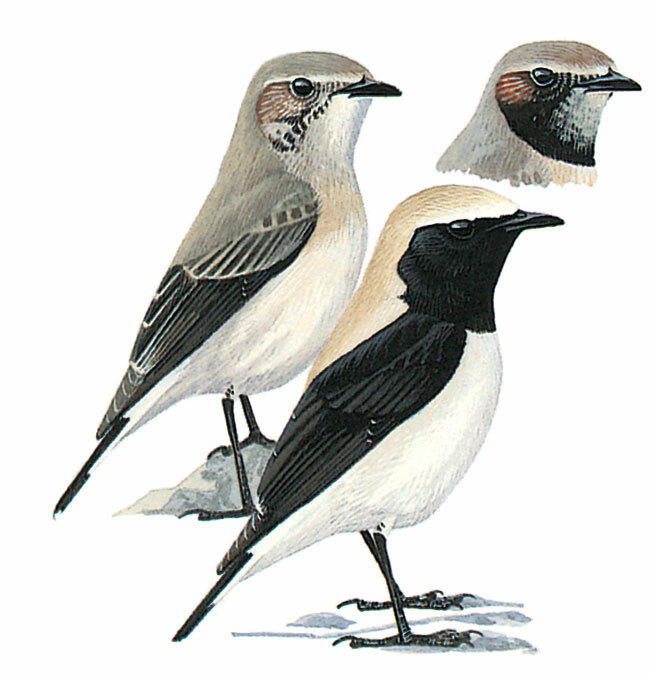 Heavier and stockier than Pied and Black-eared; male told from former by narrow buff-white stripe down mantle and back to join white rump; told from latter by larger black ‘bib’ broadly connected with black wings (beware of Black-eared with head sunk between shoulders); told from both also by terminal tail-band of even width (no black upward extension on outer feathers) and pale greyish flight-feathers below, appearing translucent above. Some females have variable blackish on throat (sometimes lower throat only); pale-throated birds told from female Black-eared/Pied by sandy brown-grey upperparts, contrasting with darker, browner wings, creamy breast lacking orange-buff tone of female Black-eared, paler flight-feathers below and tail-pattern. Female apparently shyer than male; generally ground-dwelling, perching less frequently in trees than Black-eared and Pied. On landing, frequently bows low, cocking tail, spreading and lowering it slowly, a habit aiding identification.